GRBs were first detected in 1967 by the Vela satellites, a series of satellites designed to detect covert nuclear weapons tests. 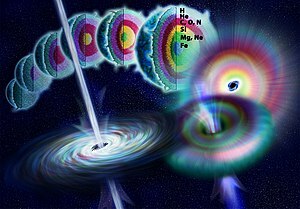 Hundreds of theoretical models were proposed to explain these bursts in the years following their discovery, such as collisions between comets and neutron stars.<ref>Hurley 2003</ref> Little information was available to verify these models until the 1997 detection of the first X-ray and optical afterglows and direct measurement of their redshifts using optical spectroscopy, and thus their distances and energy outputs. These discoveries, and subsequent studies of the galaxies and supernovae associated with the bursts, clarified the distance and luminosity of GRBs. These facts definitively placed them in distant galaxies and also connected long GRBs with the explosion of massive stars, the only possible source for the energy outputs observed.